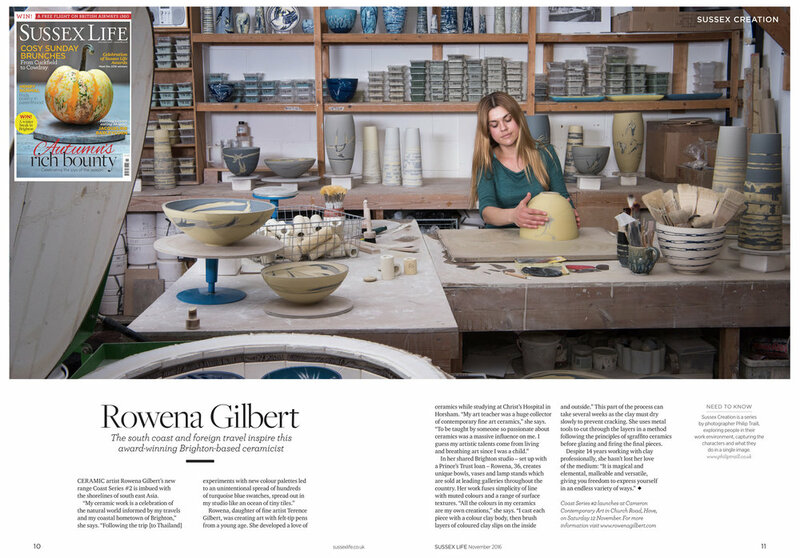 Feature in Sussex Life Magazine. (Please refer to the gallery pages for more in depth statements on the various collections). The first stage is very scientific: researching and developing clay slips. All the colours in my ceramics are my own creations. Variations in percentages of metal oxides and stains in the clay body, differences in clays, glazes, firing temperatures, all affect the final colour. It can take months to finalise a colour palette for a new series. The next stage is very rhythmic and therapeutic: I cast the bowls or vases with various coloured clay bodies, then brush layer upon layer of coloured clay slips on the insides and outsides of the body. I work on around eight pieces at any one time as the layers need to dry to a leather-hard stage before the next layer can be brushed on. Depending on air temperature and humidity - and the amount of layers I am wanting - this can take a week to a few weeks as slow drying is essential to ensure no cracking in the final stages. My Reef Series and Coast Series mark a step away from the more controlled work of past years. Natural themes still dominate, but in a more abstract interpretation. The new pieces embrace intuitive mark-making, showing that even as the work has matured, it has become more playful. Crafts Council Directory Maker of the Week.